People say that change is the only constant in life, and I’m not going to lie: most of the time, change and the uncertainty that it often involves scare me. I’m the type of person who likes to have an hour-by-hour outline of my activities (plus an idea of what’s for dinner!) for the following day before I go to bed each night. These next few weeks will introduce an entirely new chapter in my life: I’ll be graduating, driving across the country, looking for a job, and getting married. It’s exciting, but it’s also enough to make my head spin! Now, just because I don’t love change doesn’t mean I don’t love variety (it is, after all, the spice of life!). 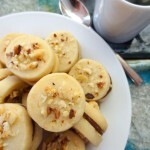 Take shortbread cookies. 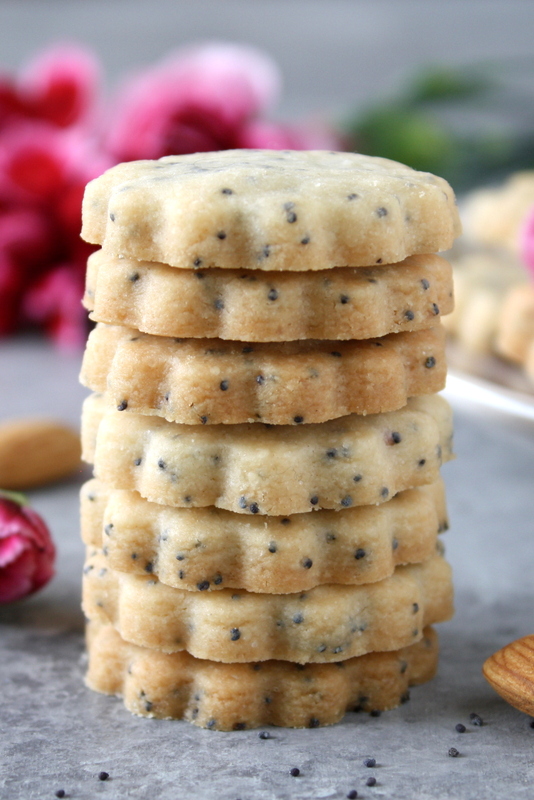 My mom found a great recipe for toasted coconut shortbread cookies a number of years ago, and I’ve used it (minus the coconut) as a base for all sorts of flavor combinations: hazelnut coconut, rosemary, white chocolate macadamia, chocolate peppermint, and now, almond poppy seed! 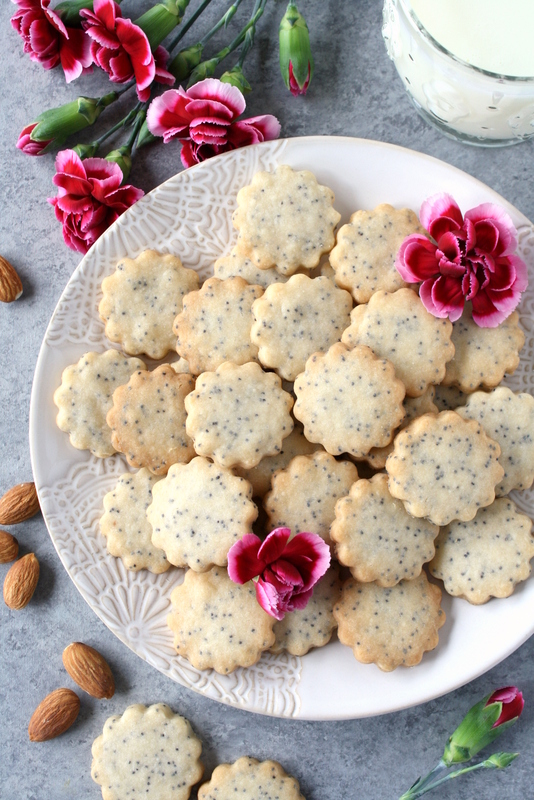 It’s hard to pick a favorite, because it depends on what I’m in the mood for, but these almond poppy seed ones are certainly the simplest to make. 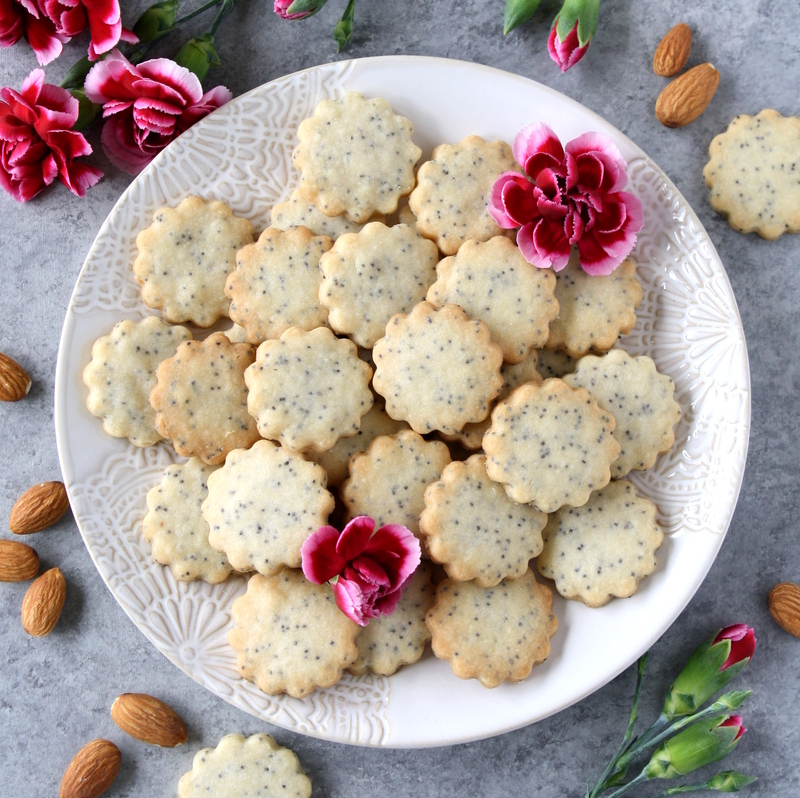 No need to toast any ingredients first or dip in chocolate afterward – just a splash of almond extract and a scoop of poppy seeds turn a cookie with a totally unassuming appearance into a treat that you won’t be able to stop eating once you start! While homemade baked goods are helping me maintain some semblance of normalcy in the days leading up to our move, Phoebe has fewer methods of recourse at her disposal. The boxes stacked around the apartment and the disappearance of familiar items have made her nervous, and she’s reverted to some puppyish behavior (like chewing things when I’m not there). Do you have any tips for how to ease a pet’s anxiety surrounding a move? How do you stay calm amid the upheaval? Cream together the butter and sugars until smooth. Stir in the almond extract. Add the flour, poppy seeds, and salt, and mix until combined. Form the dough into a disk (about 6 inches in diameter) and wrap with plastic wrap. Refrigerate for 45 minutes to 1 hour, or up to 2 days. If the air temperature is cool enough, you may be able to skip this step. Once the dough is properly chilled, preheat the oven to 325 degrees. Roll out the dough on a well-floured surface until about 1/4 inch thick. 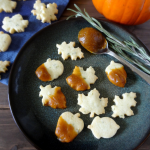 Use cookie cutters or a knife to cut the dough into the desired shape, and place on a baking sheet lined with a silicone mat (or parchment paper). Bake for 15-17 minutes, or until the edges are starting to turn slightly golden. Cool the cookies on the baking sheet for 5 minutes before transferring them to a wire rack. Makes about 60 cookies, depending on the size of the cookie cutter(s) you use. The one I use is about 1 1/2 inches. I add an extra 1/8 teaspoon kosher salt, but I recommend starting with 1/4 teaspoon (as listed) and going from there. 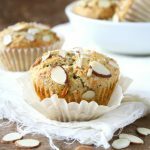 If you want extra almond flavor, add 1/2 cup chopped almonds along with the poppy seeds in step 1. I do not recommend substituting dairy-free margarine for butter in this recipe. With relatively few ingredients, the flavor of the butter is an important component of these cookies. I’m sharing this post at Recipe of the Week and Fiesta Friday (cohosted by The Frugal Hausfrau and The Not So Creative Cook). It was so great to meet you yesterday Mara! I’m impressed that amidst all the moving you were able to bake these delicious looking cookies 🙂 Change is so hard… a couple months ago we moved into one of the town homes and our puppy really struggled with the change. We just gave her lots of love, at treats LOL. Hope you have a good week! It was so nice to meet you too! Moving with pets is really quite an experience…luckily we’re well stocked in the treat department 😉 I hope your week is going well (minus this frigid weather, of course)! These cookies sound so good! I love the flavor combinations you have tried, and this one sounds especially good. Baking is a way to calm anxiety for me too, and it is a constant when everything else is changing. Best of luck with all the impending changes, but also it sounds like exciting times! Thanks, Jenny! Yes, baking can be so therapeutic. I hope you’re keeping cozy and warm! These cookies look amazing!!! I can’t wait to try making them…..
My family and I have moved 3 times with our multiple furbabies and (after a disastrous experience with a careless idiot relative and careless workers), we have boarded them at their vets whilst the movers packed up the house (or apartment). Then we retrieve them from the vet and transport them to our new home. If there is work done in the new home (or even whilst the movers unpack the boxes, we board them with their new vet)….. I can’t handle the stress of moving and losing a beloved furbaby because of a careless idiot going into rooms they were told to stay out of and leaving doors open so a furbaby could get out…..
You probably think I am crazy for boarding our furbabies, but it’s only money and if it saves my furbaby and my sanity, it’s budgeted as part of our move…..
That’s a great idea to keep pets out of the fray by boarding them while other people are trekking in and out of the house. I’m so sorry you had to go through that experience. I know there are people out there who view pets as “just” animals (and I’ve had people say similar things to me), but it’s simply part of my nature to consider my dog a family member – and it sounds like you’re the same way! Thanks so much, Kathy! I’m definitely trying to enjoy my last few weeks in Michigan (although the snow and ice are making it a little tough at the moment – I’m hoping to see the trees blossom before I go!). Wow, things are about to get really busy in the CakePants family! I’m not one bit surprised that Phoebe CakePants is having a rough transition. I mean as humans it’s hard enough…but imagine it from a dog’s perspective where they have no idea what’s going on. Perhaps make sure to keep her a little corner of the apartment with all of her familiar things? And make sure to give her plenty of attention (even more than normal!) in the evenings? Oh I know, Phoebe must be SO confused…not only am I letting people come in and take furniture, but I’m *helping* them do it?! I’ve saved her favorite blanket to bring with us in the car, so hopefully that will make her a little less anxious. I’m sure I will miss the contrast among Michigan’s seasons, but I definitely won’t be fondly reminiscing about the icy roads and whiteout conditions (which I experienced while driving this past Tuesday)! These look delicious Mara – and I love the shape of the cookie that you chose! So darling!! Thanks, Lauren! I’m glad to hear that you’re also very much a planner. I feel like being spontaneous is so often hailed as an admirable and desirable trait…and that is just not me! I am with you regarding your views on change – it scares me sometimes. The only thing I don’t mind changing are the foods I eat. Hahaha! These cookies look so perfect for this week’s Fiesta Friday party. Thanks for being here, Mara. Good luck with your move!! How exciting! My husband and I packed up our cat and moved from Chicago to Portland roughly 4 years ago. I actually wrote a blog post called “Tips On Moving Your Cat Across The Country”. If you are moving with cats feel free to check it out and ask me any questions!! Best of luck! And seriously, these cookies look amazing. 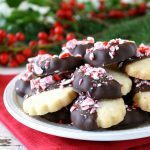 I adore shortbread so this recipe is right up my alley. Pinning! Congrats on every level! Your cookies look and sound amazing! I wish I had one now. When Chance and I moved home, he was pretty much crated in my bedroom for three days. If I had understood what a huge mess everything was going to be, I would have kenneled him to begin with. There were too many people around, relatives that came to help the folks move into assisted living, movers, organizers, people closing the house down, and with all that there were items that could have been potentially deadly, nothing was dog proofed as everything was being taken out and packed and people had things out like medicines and advil, etc. Chance is a young lab and not above snatching and chewing things yet. Chance likes his kennel, and I figured a confinement and boredom were better than any trouble he could get into but I do still feel a bad about it. Once we were home, he settled in like a dream. That part lab part explains a lot! They have this spray that is supposed to calm dogs.called Sentry, it’s a calming spray but I haven’t tried it although my neighbor swears by it. There are also calming treats. Our dog trainer says to act really excited about things that are a changes and encourage the dog to smell and move around and sniff objects. That might help? I’ve never had poppyseed shortbread. I hadn’t either, until I made these, but they’re a perfect match!